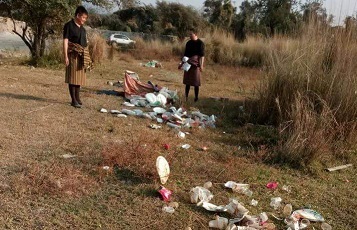 Trails of littered picnic trashes by picnickers from Assam in Bhutan left the people of the state red-faced. Look at the photograph from social media post. And ponder over. The post shows Bhutanese employees are cleaning the picnic spot in Moukhola area of the country littered by the picnickers from Assam. It also raises question about the sincerity and responsibility of the picnickers from Assam in keeping the environment clean. 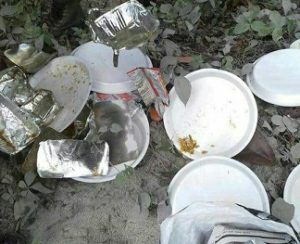 The social media post by the park ranger of Royal Manas National Park in Bhutan has exposed how irresponsible the picnickers from Assam are. Netizens are showering their wrath on such acts by Assam picnickers. These picnickers have brought shame to the state and left the conscious people red-faced. Every winter Bhutan attracts our picnickers with its scenic beauty. People carry their food items, bottles, cans, plates to these spots and enjoy feast there. But they never carry sacks to collect the picnic trashes. Once they are done, they leave trails of trashes, litter those areas forgetting the fact that keeping these spots clean is also their responsibility. “You all come for picnic polluted the area along the Moukhola which Assam people call Ai river when it reaches India, this river flows down to your area only. After picnic you all will go back with music with full enjoyment satisfaction. But look back the impact not only in Bhutan but from this same river you all have to drink, wash and also irrigate your Field,” the post says. Not only this, these irresponsible picnickers toss beer and wine bottles, break the bottles before leaving the spot.